We are living in an extremely cause-heavy world where causes - real and imagined cloud our minds. I saw this in the case of the movie - Beauty and The Beast. There the quarrel of the social commentators was that it explored the gay angle of one of the characters only briefly, only fleetingly. There can be nothing more absurd than that. You are demanding more from an artist than possibly he can offer. Art is a profession of lonely persuasion, and it serves the purpose its creator desires it to serve. Nothing more and nothing less. It is sad and unfortunates that the liberals, which in Indian context largely translates to Leftists, insists that art is nothing but a vehicle that should be provided to them for their political agendas and narratives to ride on. It is like insisting that the reference to the Negroes in the "The Great Gatsby" should have been expanded to cover racism in detail. The brief episode was merely to substantiate the character and nothing more. Just as creative freedom lies in writing about social causes, it also lies in the desire of the writer/ painter/ movie-maker not to write about them, or write about the causes he wants to write about. Beauty and the Beast, for instance was about intellectually aware and alive female protagonist, who is able to survive the threatening and menacing presence of the beast because of it and see the beauty of his soul. It was not about gay rights, as much as you sulk about it. The world around the leftist elite is in churn, the Earth under their feet is shifting and they do not like it a bit. There is a difference between period drama, historical fiction and documentary. Whenever a story is written, a cause is propagated. That is unavoidable. The writer of the story will have that cause in the back of his mind. It is this cause which prompts and prods him to write. So it will be there, even in the weirdest and the funniest (or the filthiest, for that matter) of the stories. But the causes will not always be of your liking. This insistence and urge to appropriate every work of art is annoying the liberals with Bahubali-2. Hindustan Times celebrates the movie, the visual extravaganza that the movie is, but then, in his review (Read here) Dipanjan Sinha in the end laments that the feminist cause is not properly supported, that female characters continue to disappoint, and they turn in to someone who needs to be 'tamed' and protected. While to my mind, Devsena, the female protagonist and the consort and later, wife of Amarendra Bahubali, the father, remains untamed till the very end. 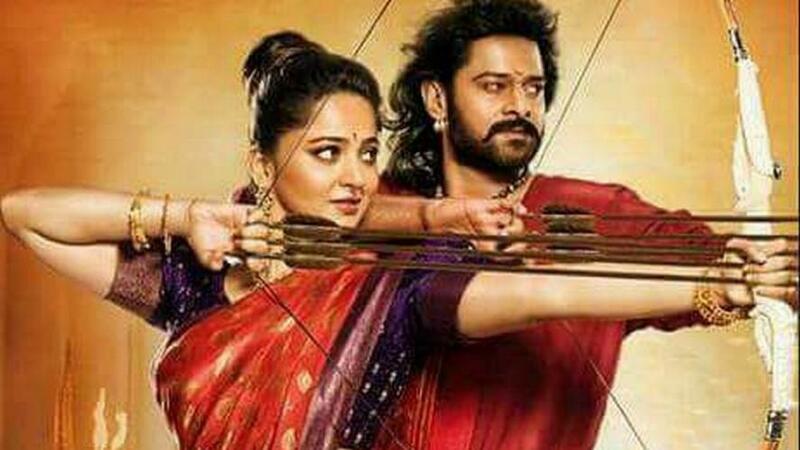 She is getting protected, mostly because Bahubali, as created in the story is a better fighter, the best of his times. But she does not bow down, not to Bahubali the husband, nor to her mother-in-law, the Rajmata Sivagami, nor to the imposingly large kingdom of Mahishmati which she says is grand only in name but have a small heart. She remains a fighter. Not that she has to. She could be been most fickle and feeble character of the story and that would be a writer's prerogative altogether. Watching the movie of course, would have been my prerogative as a viewer. But you cannot fault the art because it does not fit into the narrative. The movie is strong on Feminism in my view as the whole story would not have come into play, if the Sivagami representing the state of Mahishmati had not decided to treat Devasena as an object to be given to her older son, BhallalDev. One only needs to take off those critical, cause-stained, colored glasses that understand the whole movie is an outcome of the failure of the basic tenets of Gender equality, just as Mahabharata was for Draupadi. It makes a case for respecting a woman's wishes, and it also tells that how once a woman is in power, she runs the threat of being appropriated by a masculine state. Sivagami is a woman annexed by the masculine state, where she begins thinking, behaving and acting like a man. This is a problem which one too often finds. Even women would agree if they honestly evaluate the world around them. The women in power often become more man then the men around them. That is their biggest truth and sorriest failure. However, in this case, the movie represents much of what India of the past was, something which has been largely erased from our history by vested interests. So we have a very matriarchal society, the rule of Mahishmati is the wish of Rajmata Sivagami, Devsena embodies a warrior-woman who wants to make her own choices and as the movie tells us- is entitled to. Unlike Bahubali-1, the Gods prayed to are not fictional, rather their is Shiv and Krishn being prayed and celebrated in the movie. This is another reason many leftist liberals scoffed at the movie. Newslaundry report has the quarrel with what Deepanjana Pal calls Hindu bent of the movie (Read Here). She has a problem with men playing with Bulls and Cows, which goes against the beef-eating liberal mind, the mind which celebrates beef as a sign of secularism and while crying buckets over dogs and horses, considers cow-slaughter flag of freedom, ignoring that the same is illegal in most states in line with the spirit of Indian constitution, which gave a consideration to majority sensibilities which were largely ignored and thrashed by rulers over the centuries. That an agrarian society was likely to have sports built around cattle they raised, even if it looks like Kambala escapes her. She even is saddened by the fact that "There is not a single non-hindu culture in this film." Judge the movie, not the context please, I would say. She must brace herself since a movie on King Richards is about to be released and most likely this movie on British history will not have any Sikhs. Have heart, Deepanjana, this is fiction and it should be true to the times of which the story belongs. This is very unfortunate that we live in the time, where a work of fiction needs to explain historical validity while an Assistant Professor, Audrey Truschke passes off her fiction on Aurangzeb as history. LiveMint in its review (Read Here) laments that there are casteist connotations to valor in the movie. At several places the character talks about Kshatriya warrior ethics. This being a period movie, it refers to Kshatriya as a warrior clan. While the movie is not a historic documentary, it by all references talk of the times gone by and represents to the mores and morals of those time. Even then, it does not talk about caste as per birth, rather warrior class. Even if it were a caste, it does not looks down at other castes. There are movies in English celebrating Gentlemen code of conduct, based in middle age. Even if a character did, it is because that is what the character thinks and wants to do. These characters represent their times which is the success of the movie. So cows are important aspect of a life seeped into agricultural world, and Gau Rakshaks or not, Kshatriyas or not, the cattle-raisers are pressed into military service when Devsena's small kingdom is attacked. There are subtle attacks at caste by birth, as Bahubali calls common citizen to join a just fight, there are subtle statements, equally on women emancipation in the character of both Devsena and Sivagami. This was never meant to be a story of social reform, it is a movie of a Son's revenge for his wronged father, and it stays that. The story borrows the theme from Mahabharat - the great Indian Epic, which leftist would call, Hindu epic. This movie celebrates the mythical -historical greatness of India.We do not know how much of it is true. No one can know how true the history is. Every moment which will soon gather dust over its face and sleep into obscurity, and one day become history, holds greatness and baseness in its being. Each moment in the past, just as every moment in the past is made up of bravery and cowardice; frustrating failures and spectacular successes. That is what makes history, that is what makes a nation. A nation which has, in spite of having numerical supremacy, been ruled for close to seven hundred years by invaders much different and disparaging then those who were ruled, runs the risk of having all its moment of glories erased from public memory. This is a part of the nefarious design of intellectual colonialists who want your minds to forever be subservient slaves. So the Aryabhattas, the Bhaskaracharyas, the Kalidasas go out of the windows and when an expectant nation looks at past through fictions and fables, all one finds is the bitterness and the taste left in one's mouth is the dust of past failures. This absurdity has gone for such long that a nation whose spirit has been broken over the centuries was even deprived of its the right to its historic existence when Historians claimed that there was no country as India before it was invaded (and by implication civilized) by invaders and colonialists. That the India which, while as early as 7th century (around the time Prophet Mohammad was waking up to revelations which was to unite the Arab world across tribes and set up an empire), was known to have around 80 kingdoms; they were a part of two large major kingdoms, and the external world looked at India as India- the whole, the Chinese would call it a Yin-tu India as early as 2nd century BC,as a nation with five units, from Afghanistan to Assam and Kashmir to Cape Cameroon, . Our history has largely been erased, and we are offered only those parts where we failed as a nation. Bahubali 2 celebrates that nation, it resurrects national confidence without being patriotic saga. It talks about the national spirit of India which always celebrated and worshiped the woman before the invaders walked in and left us with dishonest intellectuals and their alternative readings when they left. The success of India lies in the hunger of Indians as a nation to its lost glory and greatness. What do the intellectuals, so out of touch with reality know about it? It is evident in the way almost the entire theater stand up in attention to honor national anthem, while our celebrity intellectuals deride it. People not only stand up, they also sing it. Those are the people who go out and watch Bahubali 2. It is not a magical script. It is not a brilliant acting, the enlarged eyes of Sivagami haunts you beyond a point, dialogues dubbed in Hindi aren't subtle or articulate. Beyond excellent screen presence of the actors, acting largely is mediocre. But the message which is not the story, the belief in the great nation that once we were, before being trampled over, is too pronounced to be missed. The beauty of a bucolic, agrarian society with its moorings and morality, which we love in Switzerland but laugh at in India, being too Hindu for modernistic tastes, is what holds the movie and interest of the viewer. Each frame is perfect and each scene is spectacular. The visual glamour of the movie holds you to each frame right from the grand entry of Amarendra Bahubali warding off the elephant charging at the Queen Mother, amid whistles and claps. Towards the end the movies goes over the top with Ironman kind of stunts, the turns of story are predictable, with all its "Why Katappa killed Bahubali?" marketing overdrive. While the main protagonists are perfect-fit for the roles they portray, the dialogues are superficial, the script is weak, movie is too long and gravity-defying stunts become too much (but we never complained about Fast and Furious or X-Men much). Violence is too gory at times, with heads severed from the body. But then these unbelievable stunts have long been part of south-Indian movies and one ought to go prepared for them. Still there is something lingering which stays with you once you walk out of the theater. It is the sense of grandeur, the belief in greatness in the Bharat, that is India, as the constitution mentions it. This movie is celebration of Bharat. That is where the movie wins, in spite of all its flaws. Do watch for the grand visual spectacle that this movie is. I would rate it 3.5 out of 5.